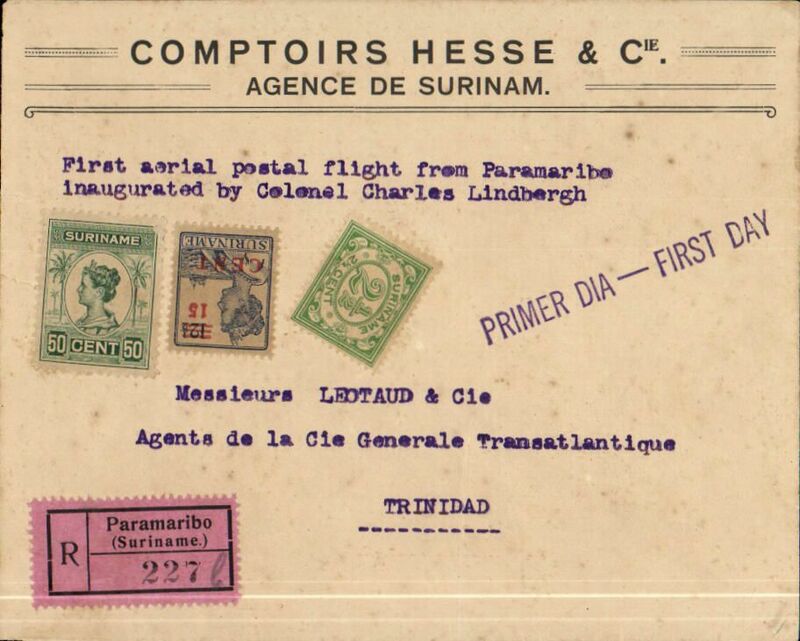 FAM 6 F/F Paramibo to Port of Spain, Trinidad, no arrival ds, Hesse &Co registered (label) cover, franked 67 1/2c, uncancelled, typed "First aerial postal flight from Paramibo/inaugurated by Colonel Charles Lindbergh", als 'Primer Dia-First Day' hs, flown by Lindbergh. Small non invasive closed lh edge tear, does not detract. 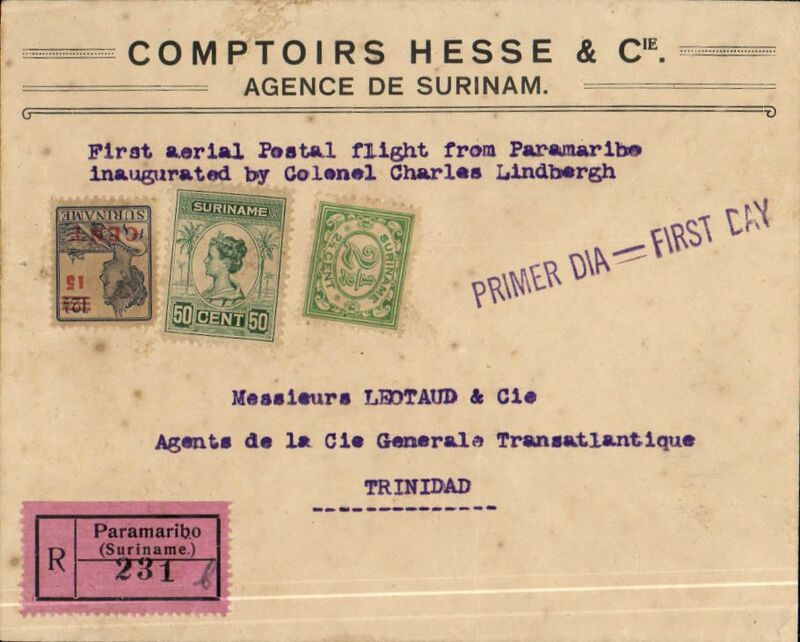 FAM 6 F/F Paramibo to Port of Spain, Trinidad, bs 25/9, Hesse &Co registered (label) cover, franked 67 1/2c, uncancelled, typed "First aerial postal flight from Paramibo/inaugurated by Colonel Charles Lindbergh", als 'Primer Dia-First Day' hs, flown by Lindbergh. FAM 6 F/F Paramibo to Georgetown, British Guiana, bs 25/9, registered (label) cover (10x 22cm) franked 52 1/2c, cancelled Paramibo/25.9.29 dated cachet, typed "Per first air mail service of Pan American Airways Inc/lead by Colonel Charles Lindbergh on the inaugural trip in September 1929", flown by Lindbergh. FAM 6 F/F Paramibo to Georgetown, British Guiana, bs 25/9, registered (label) cover (10x 22cm) franked 54 1/2c, cancelled Paramibo/25.9.29 dated cachet, typed "Per first air mail service of Pan American Airways Inc/lead by Colonel Charles Lindbergh on the inaugural trip in September 1929", flown by Lindbergh. F/F Paramibo to Nickerie, b/s, large violet flight cachet, Pan Am. Carried by Consolidated C16 flying boat. Pan Am F/F Nickerie to Paramibo, bs 23/7, plain cover franked 18 1/2c, b/s, large violet flight cachet, carried by Consolidated C16 flying boat. Signed by the pilot E.G.Schultz. 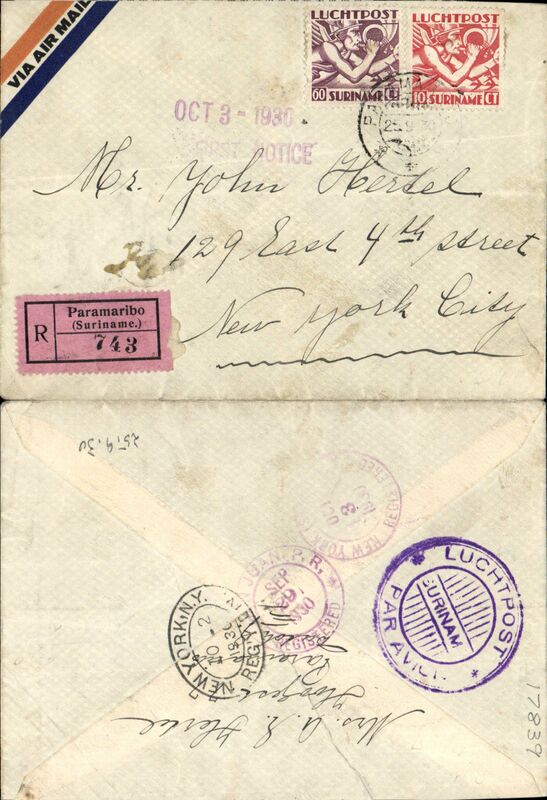 FAM 6 extension to Paramibo, Paramibo to New York, bs 2/10, carried on FAM 6 F/F Paramibo to Miami 3/10, via San Juan 29/9, registered (label) airmail cover franked 70c, canc 'Paramibo/25/9/30', fine strike violet circular 'Luchtpost/Surinam/Par Avion' hs verso. Nice routing. 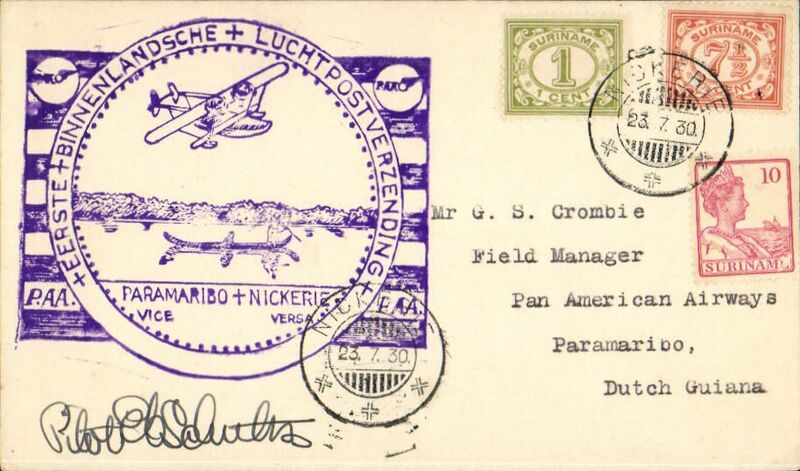 KLM SNIP F/F Paramibo-Willamstad, bs 22/12, large cachet, reg (label) airmail cover. 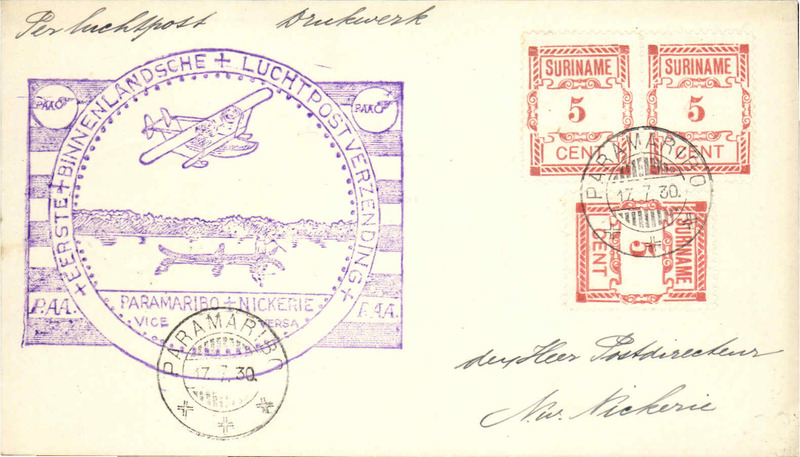 DLH South Atlantic Airmail Service, Paramibo to Germany, no arrival ds, commercial airmail corner cover franked 2x 40c air & 5c, typed "Via Recife (Brazil)". 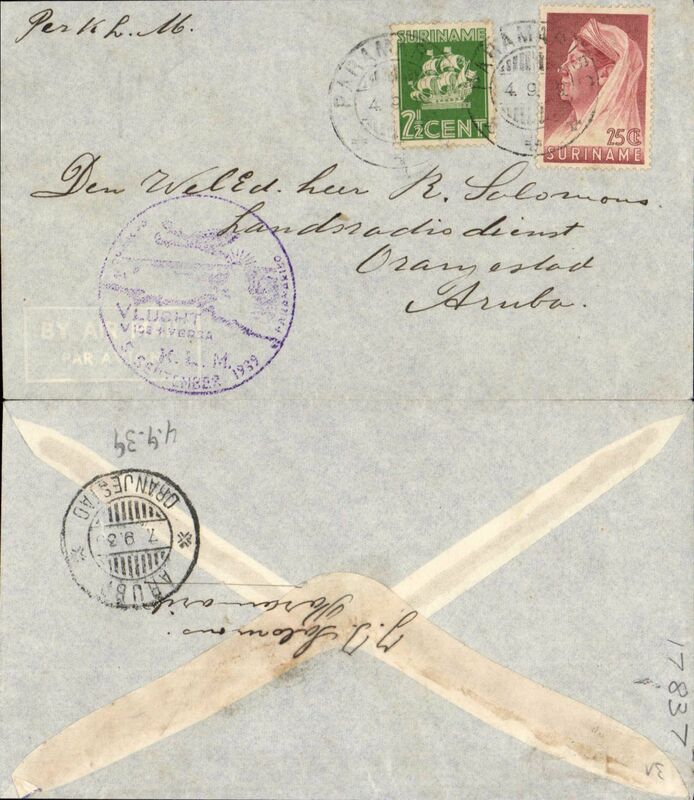 KLM, first acceptance for Aruba, bs Oranjestad 7/9, for carriage on KLM F/F Paramibo to Curacao, airmail cover franked 27 1/2c, canc Paramibo cds, violey circular flight cachet. 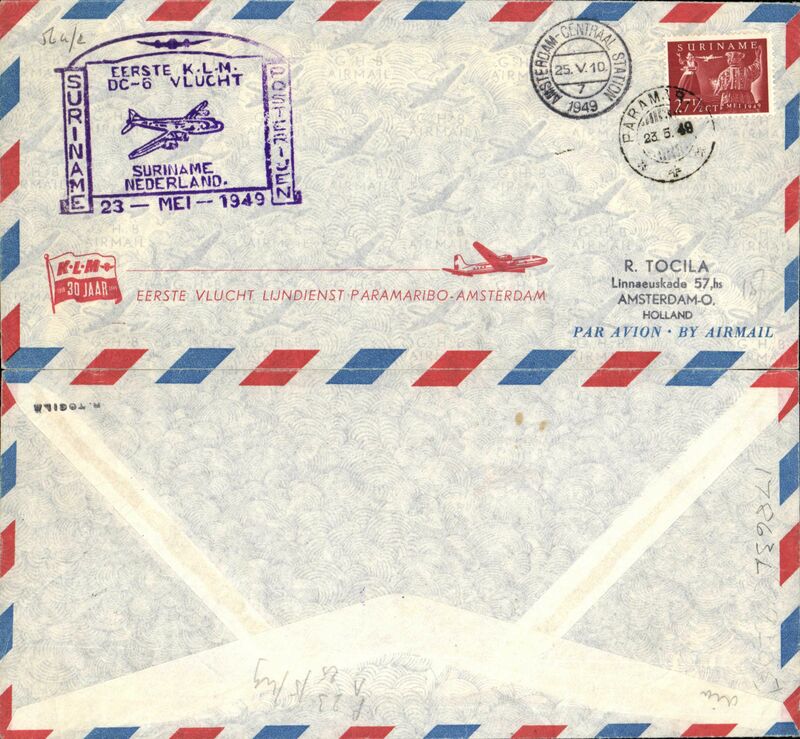 KLM F/F Paramibo-Amsterdam, 25/5 arrival ds on front, airmail cover franked 27 1/2c, large purple fiht cachet. KLM F/F Paramibo-Amsterdam, 25/5 arrival ds on front, printed souvenir cover, 22x10cm, franked 27 1/2c, fine strike large purple flight cachet.